MANOWAR - KINGS OF METAL MMXIV SILVER EDIT. (2CD BOX) | Online Shop | Wizard LTD. Album: "KINGS OF METAL MMXIV SILVER EDIT. (2CD BOX)"
‘Kings of Metal MMXIV’ is a completely new recording, celebrating the 25th anniversary of the release of ‘Kings Of Metal’. The ‘Kings of Metal’ release in 1988 and the following world tour in 1989 catapulted MANOWAR into a new sphere. Songs like "Heart of Steel", "Kings of Metal", "Hail and Kill", and “Blood of the Kings” became instant classics, celebrated since by metal fans all over the world. 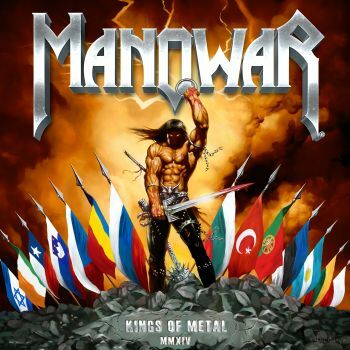 For ‘Kings Of Metal MMXIV’, MANOWAR have recorded these timeless metal anthems with new arrangements and their signature “larger than life” sound that sealed their place in heavy metal history. The spoken word track “The Warrior’s Prayer MMXIV” features celebrated British actor Brian Blessed, a renowned Shakespeare and character actor who has starred, among others, in Kenneth Brannagh's “Henry V”, in “King Lear”, and as Prince Vultan in the cult movie “Flash Gordon”. Special effects of the highest level were provided by award winning sound designer Hamilton Sterling, known for “Batman - The Dark Knight”, “Men In Black 3”, “War of the Worlds”, and “Master and Commander: The Far Side of the World”, two of which won Oscars® for Best Sound Editing.